Our wide variety includes marble, travertine, limestone, slate and quartz. We carry beautiful, naturally sourced stone from around the world, including Italy, Spain, Portugal, Turkey and Canada. All stone products come in a variety of naturally occurring colors and veining – no one piece is alike. Natural stone tile is suited for a wide range of applications including both floor and wall. Many different formats and finishes are available such as polished, matte, and brushed. Natural stone has several benefits for the modern homeowner. Many natural stone types can be made easy to clean and will increase the value of the home. The strength of porcelain comes from unique clays that are fired at extreme temperatures which produce a harder, denser tile for unmatched durability that outperforms even granite. From ancient civilization to the modern age, porcelain and ceramic tiles have always shown their strength, resistance and natural beauty. It is a material formed from clay, sand and other natural substances. The body is then carefully shaped and moulded before it is fired at high temperatures. With today’s advance technology and superb artistry, it brings new meaning to “ever lasting beauty”. Whatever the colour, texture, design or decoration, ceramic technology can reproduce it. Products from Asia, Brazil, Italy, Spain and Greece provide us with unique design solutions that combined create a phenomenal collection. Our supplier, Urban Zebra, also has a lovely variety of mosaic tiles to chose from. Click on the links provided to browse the different styles and varieties. Our professional installers can help you create the exact environment to suit your needs. Drop into the store to get a true feel for these unique products and discuss the advantages that the different types of tiles have to offer. Keep in mind that tile flooring can tend to be a bit chilly during the cold months of the year. Be sure to read about our In-Floor Heating option. We will be happy to help you understand how this works before deciding upon the type of flooring that best suits your preference. Ceramic and stone tiles are durable, easy to maintain, and hygienic, representing the ideal surface coverings. However, today’s lightweight construction methods can make the installation of hard surface coverings particularly challenging. 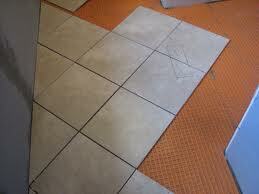 In order to protect the integrity of the tile assembly, an underlayment that performs multiple functions is required. 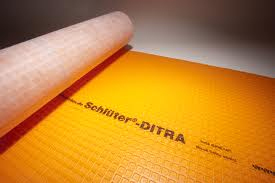 Schluter-DITRA-XL is a polyethylene membrane with a grid structure of square cavities, each cut back in a dovetail configuration, and an anchoring fleece laminated to its underside. Schluter-DITRA is bonded to the substrate using thin-set mortar. The anchoring fleece on the underside of Schluter-DITRA-XL is engaged in the mortar to provide a mechanical bond to the substrate. Tile is installed over Schluter-DITRA-XL using the thin-bed method in such a way that the mortar becomes mechanically anchored in the square, cutback cavities of the Schluter-DITRA-XL matting. Designed specifically for ceramic tile and dimension stone installations, Schluter-DITRA-XL serves as an uncoupling layer, waterproofing membrane, and vapor management layer that accommodates moisture from beneath the tile covering. Further, DITRA-XL performs all these functions while still providing adequate support/load distribution for the tile covering. Tile has been successfully installed for thousands of years by incorporating an uncoupling layer, or forgiving shear interface, within the tile assembly. Schluter-DITRA-XL provides uncoupling through its open rib structure, which allows for in-plane movement that effectively neutralizes the differential movement stresses between the substrate and the tile, thus eliminating the major cause of cracking and delaminating of the tiled surface. 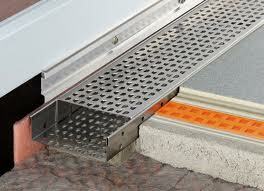 Schluter-DITRA-XL provides reliable waterproofing in interior and exterior applications. Its polyethylene composition protects the substrate from moisture penetration, which is particularly important in today’s building environment where most substrates are moisture sensitive. The distinguishing feature of Schluter-DITRA-XL is the existence of free space created by the configured channels on the underside of the matting. The free space provides a route for excess moisture and vapor to escape from the substrate that could otherwise cause damage to the tile layer above. Thus, DITRA-XL effectively manages moisture beneath the tile covering. When placed on a solid foundation, columns or pillars can support tremendous loads. The same physical principle applies to Schluter-DITRA-XL installations. Columnlike mortar structures are formed in the cutback cavities of the matting. Loads are transferred from the tile covering through these column-like mortar structures to the substrate. Since DITRA-XL is virtually incompressible within the tile assembly, the advantages of uncoupling are achieved without sacrificing point load distribution capabilities. The ability of DITRA-XL installations to support and distribute heavy loads while preserving the integrity of the tiled surface has been verified through extensive laboratory and field testing.